Having a Car AC condenser leak is a very common problem. 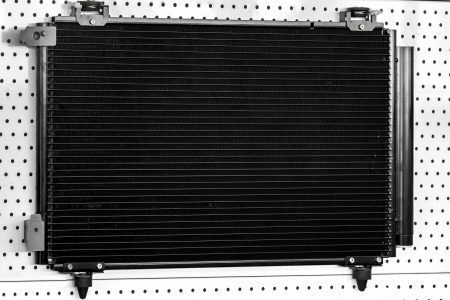 The condenser is mounted on the front of your car in front of your radiator, the fans and just about anything else that can protect it. Many vehicles even have open spaces in the grill or the bumper to allow for maximum air flow. Unfortunately, maximum air flow can lead to a car AC condenser leak when rocks or road debris damage it. It is important for the AC condenser to be at the front of your vehicle where it receives maximum air flow to make sure your air conditioning system works properly. Your air conditioning system is highly dependent on the refrigerant being properly cooled before it travels through the rest of your system. Once the refrigerant is cooled to ambient temperature, it travels to the expansion valve where it is allowed to depressurize and be cooled. Without the refrigerant being properly cooled in the condenser, it won’t create cold refrigerant in the expansion valve and you’ll end up with warm air coming out of your vents. An AC condenser leak is a leak that can be easy to fix no matter how big it is. If you’ve got a large leak, such as a visible hole or obvious damage to your condenser, usually, the best solution can be replacing the condenser entirely. Since your condenser is at the front of your vehicle it is easy to remove. First, you must have your air conditioning system evacuated to remove all the old refrigerant. Once the system is at a vacuum, you can remove the refrigerant lines by unbolting the connections. Next, remove the condenser mounting bolts and pull the old condenser out. To install the new condenser, start by mounting it in the location of the old condenser. Next, replace the O-rings on the lines going to and from the condenser and reinstall them. Once the system is sealed, evacuate the system to remove all the air, then refill it with the recommended amount of refrigerant and compressor oil and you should be back to driving a cool and comfortable car. If you have a condenser leak that isn’t big enough to see, you should consider using Red Angel A/C Stop Leak to seal the leak in your condenser rather than going through the trouble of replacing it and the cost of having your system evacuated and recharged. Red Angel A/C Stop Leak is a stop leak liquid that can be added to your air conditioning system using the BlueDevil Oil Injector. Once it is injected into your system, Red Angel A/C Stop Leak will travel to the leak site and there form a chemical bond on your condenser to keep any more refrigerant from escaping. For more information about Red Angel A/C Stop Leak, visit our product information page here: Red Angel A/C Stop Leak.